The year 2015 is the 100th anniversary of the Armenian Genocide. Therefore, the year 2015 must become a different year in its depth and meaning with its goal and message for each and every Armenian. The Armenian Genocide has left an indelible imprint on the collective memory of the Armenian people. There is no Armenian in the world whose blood has not been forged, or whose life has not been engulfed by the Armenian Genocide. There is no Armenian on earth whose family has not experienced genocide, exile, homelessness, or dispersion. For one hundred years we remembered with incense and prayers our million and a half martyrs, who were sacrificed in Western Armenia and Cilicia during the genocide planned and executed by the Turkish Ottoman Empire. For one hundred years we remembered with lament and anger the destruction and ruins of our centuries-old cultural and religious sacred treasures—churches, monasteries, cross-stones, sacred sites, manuscripts, and innumerable spiritual intellectuals by the hand of the same genocidal perpetrator. We remembered for one hundred years with eruptions and demands for the many thousands of national, religious, and individual properties that were confiscated during the genocide. Truly, following the 1915 genocide and exile the beautified and flourishing cities and villages produced by the creative Armenian spirit in Western Armenia and Cilicia became a wasteland. How appropriate are the following words of the psalmist for the death and destruction of the Armenian genocide: “O God, the nations have come into your inheritance; they have defiled your holy temple; they have laid Jerusalem in ruins. They have given the bodies of your servants to the birds of the air for food, the flesh of your faithful to the wild animals of the earth. They have poured out their blood like water all around Jerusalem, and there was no one to bury them.” (Psalm 79:1-3). The criminal intent of the genocidal perpetrator was genocide, exile, and the destruction of the Armenian people, and with the dispersion to erase the Armenian people from the world map…. Thereafter, the orphaned Armenian people—the children of the survivors—uprooted from their ancestral land never forgot the martyrs; did not forget their sacred legacy. They heard Christ’s commandment, “Do not fear those who kill the body but cannot kill the soul” (Matthew 10:28). Girded with this faith and strengthened by the vision of the rebirth of the Armenian people, they re-organized their individual and collective life. They built churches and schools, established community institutions and organizations throughout the Diaspora. They also reminded the perpetrator and all humanity of the unpunished genocide and demanded justice for their people. Truly, during the last one hundred years, our Church, our Armenian Cause, organizations, and for the past two decades our re-established Armenian Republic, through advocacy, politics, relationships, and other means not only reminded the world about the Armenian genocide, but also continuously and tirelessly pursued recognition of the 20th century’s first genocide that remains unpunished. In fact, today there are a large number of countries, churches, and organizations that have officially recognized the Armenian genocide. Along with Armenians, many non-Armenian scholars have published many works studying the many facets of the Armenian genocide and advocating its recognition. The children of our people remained faithful, even during their most difficult times, to the legacy of the martyrs and made an oath, again in the words of the psalmist, “If I forget you, O Jerusalem, let my right hand wither! Let my tongue cling to the roof of my mouth if I do not remember you” (Psalm 137:5-6). For one hundred continuous years our people’s brave children remembered and reminded others by knocking on the door of people’s closed hearts and minds and making the recognition of the genocide the center of their struggle. It is necessary to continue that same sacred struggle with pan-Armenian measures and renewed effort. The time has come for our people to give our demands new impetus and contemporary by bringing it into the judicial realm and in the light of international law pursue their violated rights. Genocide and human rights declarations clearly state that genocide is a crime against humanity and therefore the criminal, be it an individual, an organizations, or a government, must come before the international court of justice. International law also emphasizes that recognition of genocide means reparation. Therefore, the recognition of the Armenian genocide must not be considered to be the goal of the Armenian people’s demands. Recognition and reparation must be considered together, closely connected as one and indivisible entity and must become the strong foundation and clear goal of the Armenian people’s struggle. It is possible that the current geopolitical conditions are not favorable for our demands. Perhaps, the genocidal perpetrator, with its diplomatic and economic effective means will hinder any attempts by our people toward this direction. However, in spite of this harsh reality our people are summoned to continue their demands with even greater faith and commitment. The Armenian people in Armenia, Artsakh, and the Diaspora, are preparing to commemorate the centennial of the genocide with unified spirit and unified effort. This 100th anniversary is not, nor should it become, an ordinary anniversary. It is our duty to make this date a worthy event in our nation’s life with a high level of zeal and purpose. The 100th anniversary must become a turning point in our people’s struggle to regain our just rights. 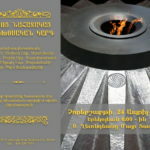 The collective sanctification of the martyrs that will take place on April 23, 2015, in Holy Etchmiadzin under the presidency of the Catholicoi, will most certainly be an important event in the 100th anniversary sphere. The Armenian Cause is the cause of each Armenian and all Armenians. It is our martyrs’ cause, the cause of our future generations. So every Armenian is called upon to contribute in our pan-Armenian efforts to regain our rights. – Our Prelacies, for the extensive participation of our people at religious services, public meetings, and other events to keep the memory of our martyrs and to keep alive their eternal message. – Our organizations working within the life of our nation, to make collective efforts and with a unified spirit organize and evaluate this important event in our lifetime. – Our educational institutions, to be attentive to the formation of the students in human and Armenian values and give special attention to the 100th anniversary in our schools, teaching our students about the meaning and message of this anniversary. – Our intellectuals, through their research and lectures, to focus on the imperative of recognition of the genocide and the demand for reparations. 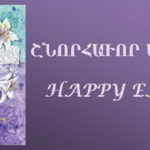 – To all Armenians, to be full-hearted participants in the efforts on behalf of the Armenian Cause in general, and for the 100th anniversary events in particular. May the memory of our one-and-one-half million martyrs always remain alive, and their legacy always resonate in our individual and collective lives. Let us walk forward toward our bright future, renewed with our Christian faith and strengthened by our martyrs’ message. May you live forever in the Lord, be strengthened with the grace of the Holy Spirit and be forever blessed by us. Amen. 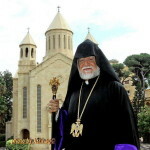 ARAM I CATHOLICOS OF THE GREAT HOUSE OF CILICIA Encyclical delivered at the Catholicosate of Cilicia, in Antelias, Lebanon December 28, 2014, in the year of our Lord.